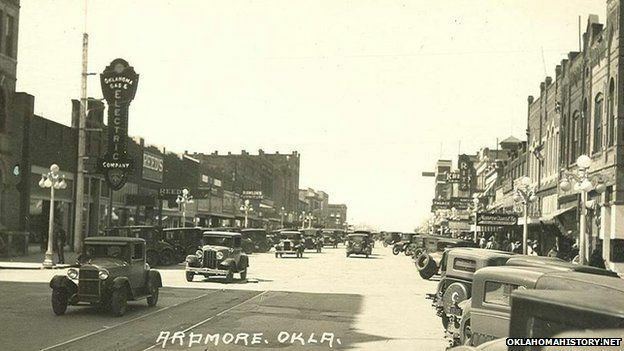 Ardmore is a business, cultural and tourism city in and the county seat of Carter County, Oklahoma, United States. As of the 2010 census, the city had a population of 24,283, with an estimated population of 24,950 in 2013. The Ardmore micropolitan statistical area had an estimated population of 48,491 in 2013. Ardmore is located 90 miles (140 km) equidistant from Oklahoma City and Dallas/Fort Worth, Texas, at the junction of Interstate 35 and U.S. Highway 70, and is generally considered the hub of the ten-county region of South Central Oklahoma, also known by state tourism pamphlets as "Arbuckle Country" and "Lake and Trail Country". Ardmore is situated about 9 miles (14 km) south of the Arbuckle Mountains and is located at the eastern margin of the Healdton Basin, one of the most oil-rich regions of the United States. Ardmore was named after the affluent Philadelphia suburb and historic Pennsylvania Main Line stop of Ardmore, Pennsylvania, which was named after Ardmore, Ireland, by the Pennsylvania Railroad in 1873. The name "Ardmore" is Gaelic, signifying high grounds or hills. Ardmore, Indian Territory, began with a plowed ditch for a Main Street in the summer of 1887 in Pickens County, Chickasaw Nation. It owes much of its existence to the construction of the Santa Fe Railroad through the area during that time. It grew, as most frontier towns grew, over the years into a trading outpost for the region. In 1894, notorious outlaw William M. Dalton was gunned down by a posse as he tried to flee from his home in Ardmore. A large fire in 1895 destroyed much of the fledgling town, which forced residents to rebuild nearly the entire town. In the early 1900s, Ardmore became well known for its abundance of cotton-growing fields and eventually became known as the worlds largest inland cotton port. After the fields were stripped of their fertility, however, the city found itself positioned next to one of the largest oil fields ever produced in Oklahoma, the Healdton Oil Field. 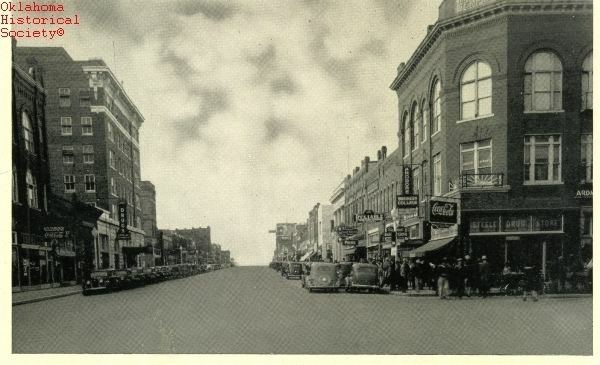 After its discovery in 1913, entrepreneurs and wildcatters flooded the area, and Carter County quickly became the largest oil-producing county in Oklahoma, and has remained so ever since. Ardmore has remained an energy center for the region ever since, with the regions natural wealth giving birth to such energy giants as Halliburton and the Noble Energy companies, among others. Ardmore also learned the perils of being energy-rich with yet another disaster in 1915, when a railroad car containing casing gas exploded, killing 45 people and destroying much of downtown, including areas rebuilt after the 1895 fire. The disaster, which made national news, gave residents the resolve to establish the citys first fire department to ensure that such events would not recur in the future. The city has not experienced any major setbacks since the 1915 fire, save a 1995 tornado that nearly destroyed the Uniroyal Goodrich (now Michelin) tire plant in west Ardmore. Despite a shift at the plant working at the time, miraculously no one was killed as the tornado ripped through the area, due to the public being alerted by area news and tornado sirens. On April 22, 1966, Ardmore was the site of the worst plane crash in Oklahoma history, which killed 83 people. Ardmore became nationally famous in 2003 when 52 Democratic members of the Texas House of Representatives, known as the Killer Ds, left Texas for Ardmore to deny the Republican-controlled House a quorum when Republicans attempted to pass a redistricting plan for U.S. congressional districts. Redistricting of congressional seats is traditionally done following the decennial U.S. census; the 2003 plan, which had been engineered by U.S. Representative Tom DeLay (R-Texas), would have been an unprecedented second redistricting in the same decade, and was promoted as a way to increase Republican electoral success. By leaving the state to stay in an Oklahoma hotel, Democrats temporarily delayed passage of the redistricting plan the Republican-controlled House. Republicans eventually succeeded at the re-redistricting, although in 2006, the U.S. Supreme Court ruled that new borders of the 25th Congressional District, a long thin chain of counties from Austin to Mexico, dubbed the "Fajita Strip", was in violation of the Voting Rights Act of 1965, since it divided up predominantly Hispanic areas into multiple districts, and a U.S. district judge ordered new boundaries favorable to incumbent Democrats Ciro Rodriguez and Lloyd Doggett to be drawn. Ardmore is located in southeastern Carter County at 34°10?52?N 97°07?46?W (34.181240, -97.129363). It is bordered to the west by the city of Lone Grove and to the east by the town of Dickson. By Interstate 35, which passes through the west side of Ardmore, Oklahoma City is 97 miles (156 km) to the north, while Fort Worth, Texas, is 103 miles (166 km) to the south. Ardmore is the principal center of trade for a ten-county region in south central Oklahoma, with a retail pull factor of 1.7 - 1.9. Ardmores major employers are Michelin North America, with 1,900 employees, and Mercy Memorial Health Center, with 900 employees. Several hundred employees work for regional distribution centers for Best Buy, Dollar Tree (Marietta) and Dollar General Stores, among others. Until early 2009, Ardmore was also home to a large regional distribution center for the now-defunct retail electronics chain Circuit City and was also home to a 1-800-flowers call center. In 2010 Ardmore lost another technology company, IMTEC, which was purchased by 3M and moved away to California. The 85,000 bbl/d (13,500 m3/d) Valero refinery in northeast Ardmore employs some 250 area residents. Ardmore is also home to the Samuel Roberts Noble Foundation, among the nations 50 largest private foundations, primarily engaged in agricultural bioresearch activities. In 2001, East Jordan Iron Works opened a foundry located at the Ardmore Industrial Airpark.